If you are fortunate enough to have lived in Hawai`i in the last decade, you might have caught a rare performance by Hawai`i’s “Three Tenors”: Robert Cazimero, Les Ceballos, and Aaron Sala. Modeled on the format made popular in the 1990s by a trio of more instantly recognizable opera stars – Jose Carreras, Placido Domingo, and Luciano Pavarotti – Hawai`i’s version of the “Three Tenors” features gentleman who – while they spend most of their time supporting and perpetuating Hawaiian music – are by no means coincidentally trained in opera as well. But they are not the first opera singers to emerge from Hawai`i. Tandy MacKenzie and Samuel Kapu come to mind. But then, too, does Charles K.L. Davis. Charles Keonaohalalalaulani Llewellyn (or “K.L.”) Davis was born September 17, 1925 in Honolulu into a household steeped in music and culture. At an early age Charlie had already conquered the cello, the piano, and even the pipe organ. Graduating from high school just before the invasion of Pearl Harbor in 1944, this smart young man became a sergeant in the 7th Air Force Intelligence, serving in Hawai`i, Saipan, Okinawa, and Washington, D.C. After the war Charlie studied at the University of Hawai`i before transferring to the Music Academy of the West in Santa Barbara, CA to pursue his passion. He topped off his studies at the renowned Julliard School of Music in New York City where he was bitten hard by both city life and his love of the stage. After an appearance on the famed Ted Mack’s Amateur Hour, Charlie’s professional career began – in a duo with fellow Hawaiian Jimmy Shigeta – on March 13, 1951 at Hollywood’s legendary Mocambo on the Sunset Strip. (Critics Louella Parsons, Hedda Hopper, and even Variety called the duo “overnight sensations.”) The debut was followed by engagements at the Flamingo Hotel in Las Vegas and The Palmer House in Chicago (where his picture still appears on the walls among such legends as Frank Sinatra, Lena Horne, and Steve Lawrence and Eydie Gorme). When Shigeta was drafted, Davis went solo. 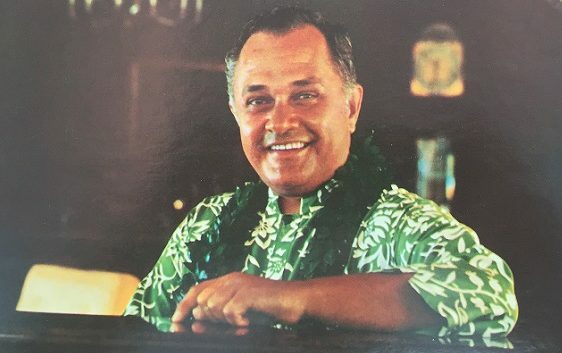 After a brief return to Hawai`i, Charlie returned to New York City where he became the first Hawaiian to win the prestigious Metropolitan Opera auditions. His popularity grew on the mainland – garnering Charlie a recording contract with Queens, New York-based Everest Records. During this period Charlie also performed in Russia with a troupe led by emcee extraordinaire Ed Sullivan as well as at the White House in a command performance for President Lyndon B. Johnson in 1959. Wherever he performed, the critics raved. Charlie was loved not only in Hawai`i, but the world over. This first post about Charles K.L. Davis focuses on his New York City days and the early part of his recording career with Everest Records. Researching this period in Charlie’s career, some of the information I have located would probably tickle his agile and often satirical mind. Such research reminds us that there are, indeed, two sides to every story. Writing for AllMusic.com, Eugene Chadbourne refers to Charlie’s recordings for a “classical budget line.” On the contrary, Everest Records was anything but a classical budget line. In fact, the label likely found it difficult to survive financially since they used the most state of the art – and, therefore, most expensive – recording techniques of the era. Magnetic tape was still a relatively new medium in the 1950s. But 35mm film was not. It has long been forgotten in this digital era, but 35mm was once the most advanced recording medium – not only for visuals, but also for audio. Everest’s introduction of 3-channel microphone/recording techniques – captured on 35mm film stock – were revolutionary for this period and in the era of “hi-fi” offered much higher fidelity than magnetic tape. This recording technique was so trend-setting and influential that none other than Frank Sinatra utilized 35mm film to record his now classic The Concert Sinatra album. Budget, indeed. The label produced very few recordings total – a mere 75 LPs. But a whopping seven of these – recorded in a brief three years – were by Charles K.L. Davis. Since Everest was primarily a classical label, this gave Charlie the rare distinction of being one of Everest’s few artists that was not purely classical. His signing was a testament to his talent and his popularity in that moment in time, and if nothing else, the label gave Charlie the rare opportunity to showcase all of his musical loves – opera, Broadway, and Hawaiian, bringing the latter back to mainland audiences during a period when its popularity was waning. Here are a few of my favorites from Charles K.L. Davis’ Everest Records catalog.